Another giveaway so soon? Crazy, but true! At last the book is available in the U.S. and having had the opportunity to thumb through it, Sarah definitely doesn't disappoint! I've enjoyed poring over the inspiring photos of avant-garde jewellery pieces created by paper artists from the UK, U.S., Spain, Thailand, Japan, Israel, Costa Rica, the Netherlands, China, Germany, Finland, Italy, Austria, Turkey, Belgium, and Australia. Besides featuring a huge collection of feast-for-the-eyes images, the 128 page, softcover book presents techniques such as paper sculpting, molding, cutting and binding, crocheting, and encasing. Each chapter begins with step-by step instructions and accompanying photos as presented by one artist. The chapter's content is then followed by a gallery where high fashion, runway jewellery is shown alongside more modest, yet unique and completely wearable items. For example, Sarah shows how to create geometric folds utilized in her origami jewellery designs and Paula Tew explains the art of stitching an exposed-spine binding using repurposed paper. There is also a helpful glossary of paper terms and a brief interview with each chapter artist at the conclusion of the book. I was sent a copy of Design and Make - Paper Jewellery from publisher, A&C Black, for review purposes. The company has offered to send a copy to one lucky person worldwide. To enter, just leave a comment on this post by Sunday, March 4. The winner will be selected by a random number generator, notified, and announced here, as well as on the All Things Paper Facebook page. Good luck! Congratulations to Prachi Bora. Her number was selected by random. org and she's delighted to have won. Many thanks to all who took the time to enter. I'd love to have a copy of this book - I haven't had time to do any papercrafting for so long, and this would be a good excuse to pick it up again and try some new techniques! Looks like an amazing book - I'd love a copy! Such lovely paper jewellery designs!! The sugar flower brooch looks so lovely. So many techniques in one book ,really desirable. Looks like a great opportunity! Thanks! My favorite here is the sugar flower brooch. As a beader I've often thought about making paper jewellery after doing paper beads some years ago. Those pieces are so cool. I've been making jewelry with paper but nothing where the paper has dimensionality like that. I'd love to learn more about it. Thanks for the chance to win! I have paper! I would love to win! Sign me up and thank you! Ann, what a great giveaway!! I love making paper jewellery and I love wearing it as well!!! 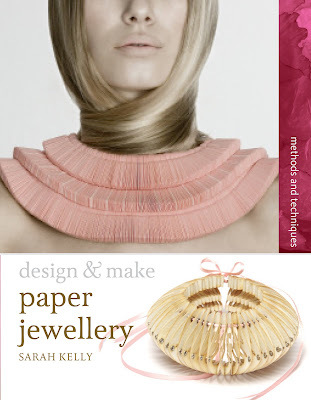 I am sure the book will sell worldwide for Sarah, with so many creative paper jewellery ideas. This would be so fun to do! thanks for the giveaway. Lovely of you to give a book away! I'd love to win it. My crafting side of me has been hidden away for so long, and has now decided it's time to come out. This looks like an amazing thing to get into! Imagine an entire book of jaw-dropping paper creations to be amazed by! Thank you for always being so generous to your readers. Ooh this would be so cool to have! A few pictures from the book on your blog has me inspired! Wonder what the book could do? I love paper and I'd love to see some of the ideas to use it to create jewellery!! Thanks for the chance! I like the idea of ​​working on paper, especially the pages of old books that dream as well! I would love a chance! Thank you for such a great opportunity!!! A copy of this book would be thrilling! Would love to have a copy of this! Beautiful! Its amazing what can be done with paper. I would love to own a copy! Thank-you! Inspirational--would love to have a copy of that book for my very own library! This is a great opportunity!! Would love to have this book in my collection!! That looks like a cool book , I wonder what happens to the jewelry if you get caught in the rain! It is truly amazing what can be created from paper! I have loved touching paper since I was little girl and the math paper in grammar school compelled me to smell it and stroke it. It was soft , creamy and it made the pencil flow on it. I think this book would be a treasure for me further love affair with paper. thank you for a chance to win this very interesting book! awww!! I would really like to have a copy of this book! best of luck to myself! Of course sign me up for the giveaway! Thanks Ann! I am a regular visitor of this site and an artist by myself. I do quilling and paper jewelery. I'd like to have a copy of this book. Wow! Some incredible pieces here. I would LOVE this book! sugar flower brooch is beautiful. What a fascinating subject. Would love to have this book. Wow! The jewellery is absolutely gorgeous! i would love to have this book. Thanks for the opportunity! By the way, you have a wonderful blog. It's inspired me to start quilling. Looks like an amazing book - What a great giveaway! I want! I want! I'm a hand bookbinder working with paper all the time and love jewelry making, too! I'd love to see more by this artist! I have a passion for anything crafted with paper. I would love to own a copy of the book. I would love to add this to my book collection. Love working with paper. I'm stunned and agog. Amazing work! A must for the library, thank you for the chance to win! I recycle for art. I have always been fascinated with artists creating jewelry with paper. I am an amateur compared to the artists published in the book but I will get there some day! Hope the give away comes my way. Would cherish it for the rest of my life. I just started getting into paper jewelry recently. It is amazing what a little imagination can make with such a simple material! Wow! Who knew that you could do such wonderful, creative, keepsakes from paper. I sure hope I win in order to check out the book and savour every photo. I hope to win a copy of this book--the designs are really amazing and obviously require some knowledge and skill to construct! wow... book sure looks interesting from the sneak peaks u have given.. hope to win it..
how crafty. i would like to try it. I love the idea of making paper jewelry and would love to have this book! Such a noble material to work with, paper... I do origami, but would love to stretch into the world of jewelry with the aid of this book. I can't wait to try to get this from my library. Thanks for posting! I'd absolutely love a copy of that! I a, always folding and expanding paper ideas and would love to see and re-create some things! I have been wanting to try my hand at paper jewelery and the designs here look delicious ! Would love to win to learn some techniques. I love making paper jewelry and am always looking for new inspiration. Just found your blog and I love it and would love to win this book. Thanks! How absolutely charming! It looks like a fantastic book. Thank you for the giveaway! Hm, this would be exactly what I'd need to spur up my paper jewelry making. I'm wondering whether my elementary school children could make a version of this jewelry for Mother's Day? I would love to see the book! gorgeous!! I'm obsessed with paper and would love to have this book! the forms are so intriguing! Looks like a fantastic book. That sugar flower brooch is just stunning! What a terrific book. Very elegant with a unique twist! Really elegant and unique jewelry! Would love a copy of this book! Wow! This book looks amazing! I'd love to try some of these projects. This is such a beautiful book! I already want the book just by looking at the cover <3 It looks amazing!! Thank you for this chance. how delicate and organic looking these pieces are! hope to win. This giveaway has ended. Thanks to all who took the time to enter and for your interest in making paper jewellery. I'm so glad to have stumbled upon your blog! Amazing offerings of paperwork, and I would really love the book--I'm very interested in quilling, and would enjoy having this book to begin my exploration of the artform!